Some years later – the sun is warming my shoulders, the sweet smell of blackberries filling my nose, my hands carefully moving among the thorns as I gather the filling for next winter’s pies – Mom calls to me from the house to let me know a birthday gift for me has arrived in the mail from my boyfriend. I smile, thinking of him, and carry the berries back to the house. The memory of the sunshine of that day and the feel of the warmth on my shoulders and the happy feeling of knowing someone was thinking of me will all become a part of the pie filling, too. Later still – when I was in my twenties – I lived next door to a woman who was studying to be a radio disc jockey. She also made amazing pies, and gave me her recipe for uber pie crust: 2 cups flour, 2/3 and 2 tbsp butter, 6 tablespoons water, and a dash of salt. I don’t remember my neighbor’s name anymore – but when I use her recipe for pie crust, I remember her – remember her friendly smile and her wonderfully raspy disc jockey voice – and I smile. 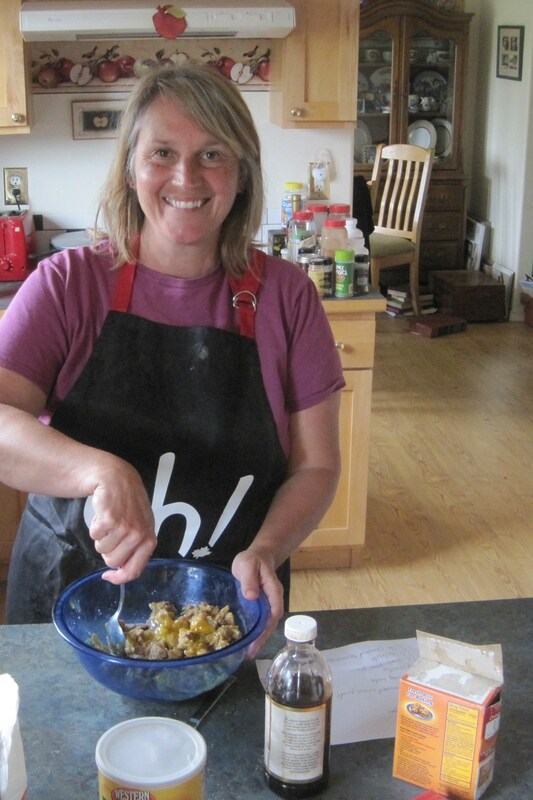 A few Christmases ago my Nova Scotian friend, Kathi, sent me an apron with the word “eh?” written on it. I always wear this apron now, when I make pies. Today – the rain is lashing against the house, a fire burns cozily in the woodstove, and Louis Armstrong sings What a Wonderful World on my stereo as I create Blackberry Pie. I’ve got Kathi’s apron on, and I’m feeling like a self-sufficient pioneer woman as I roll out the pie crust – made from the recipe given me by my d-jay neighbor – and fill it with the berries I picked in last summer’s sunshine. I am in my pie-making zone – focused on the things of the moment – rolling the crust, mixing the berries with sugar and flour for the filling, poking holes in the top of the pie and sprinkling sugar on the crust. I am creating. And there is peace.